서울발생 및 도착 통행량 추이를 살펴보면 서울에서 경기지역으로의 통행도 점진적으로 증가하는 추세지만, 경기지역에서 서울로 유입되는 통행량은 1980년 서울도착 유입량의 약 7% 수준에서 2006년에는 약 24%로, 절대수치에 있어서는 142천명에서 1,057천명으로 7.4배 가까이 증가하여 여전히 주거지역의 광역화가 이루어지고 있음을 나타낸다. 그러나 서울로의 통근율을 공간적으로 살펴보면 통근자의 30% 이상이 서울로 통근하는 지역이 1997년의 서울중심 반경 30-40㎞권에서 20㎞권으로 축소되고 있으며, 50㎞권 밖에서는 10%이하로 감소하고 있다. 이러한 현상은 서울에 집중하여 있던 직장이 수도권으로 분산되고, 수도권 외곽도시에서 자체적인 직장기반이 조성되어 서울로의 통근의존율이 점점 약화되고 있는 현상에 기인한다고 볼 수 있다. The commuting pattern of the metropolitan area shows citizens'movement pattern regardless of the boundary of administrative districts. 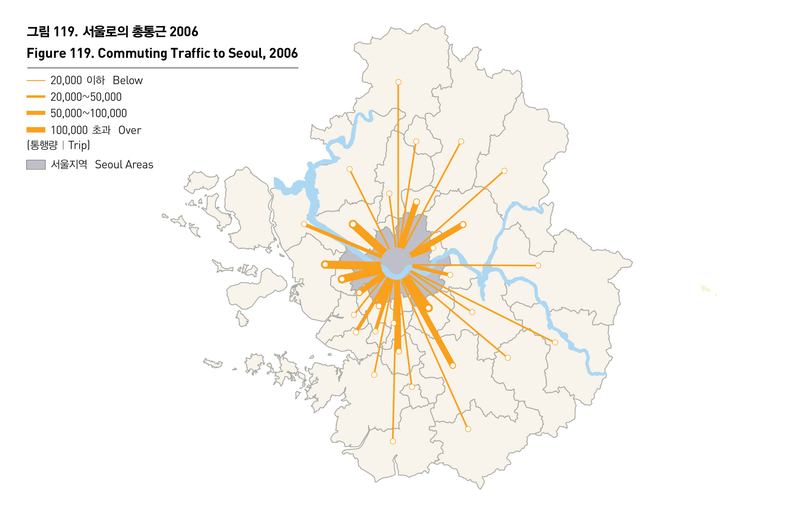 A study on trips from or to Seoul shows that trips from Seoul to Gyeonggi-do are gradually increasing, and traffic volume from Gyeonggi-do to Seoul rose from 7% of all trips to Seoul in 1980, to 24% in 2006. This is translated into the fact that there was 7.4-fold increase in people making trips from Gyeonggi-do to Seoul from 142,000 to 1,057,000, which shows that residential area has steadily expanded. 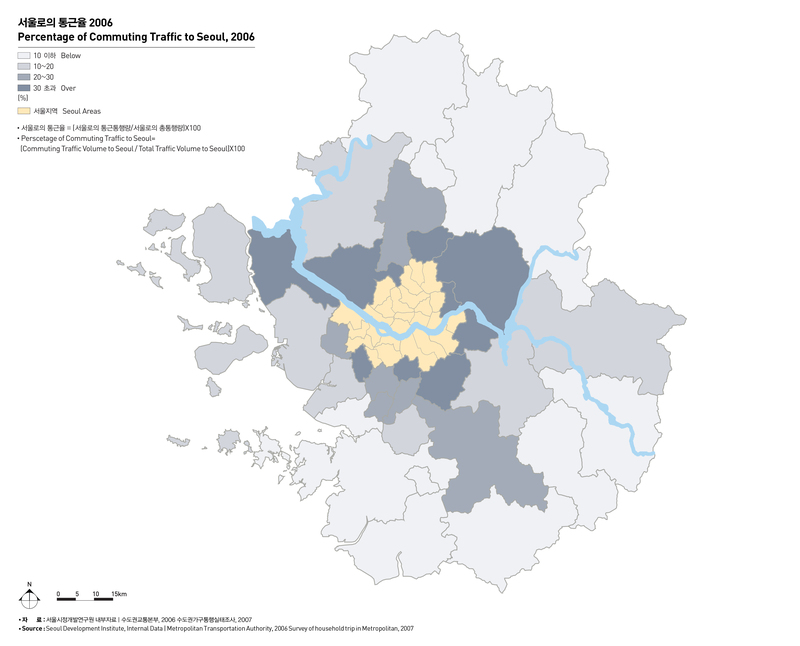 Areas with more than 30% of Seoul commuters shrank from a 30-40 km radius of Seoul in 1997 to a 20 km radius, and there are less than 10% of Seoul commuters outside 50 km radius of Seoul. The declining rate of commuting trips to Seoul is attributable to the transfer of workplaces from Seoul to the metropolitan area and a growing number of workplaces established in the outskirts.